Portsmouth PT Therapists Continue to Refine Skills! 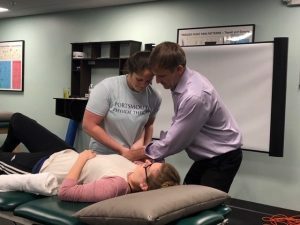 Portsmouth PTs 5 person clinical team has amassed over 200 hours of formal continuing education this year alone.That is 40 hours per clinician this year, and there is still one more course in December 2018! To put that in perspective, the state requires only 24 hours every two years. Portsmouth PT continues to stay ahead of the game and the therapists continue to put their time into being the best! Published November 6, 2018 | Posted in Portsmouth PT Blog Posts.